REACCH conducted two mail surveys of Inland Pacific Northwest cereal producers to gather information about general operations, conservation approaches, and perceptions of climate change risk. The first mail survey was sent out during the winter of 2012-2013, using a survey sampling frame drawn confidentially by the National Agricultural Statistics Service. The primary sampling criterion was based on production of 50 or more acres of wheat during the 2012 harvest year. Out of a randomized sample of 1,988 producers, 900 completed surveys were returned for a 46% response rate. A follow-up mail survey was sent out during the winter of 2015-2016 to replicate previous measurements. The survey sampling frame shifted from the original survey due to a change in policy for the National Agricultural Statistics Service. 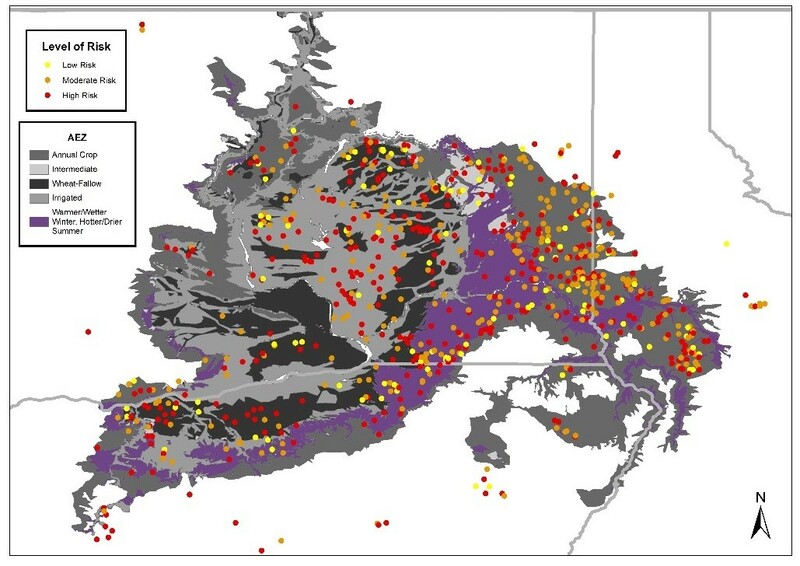 An alternative sampling frame was derived from the North American Industry Classification System along with a supplemental sample of producers who selected to be re-surveyed from the original effort. The primary sampling criterion was based on production of 100 or more acres of wheat calibrated to the harvest year. A total of 462 producers completed the survey for an overall 43% response rate. Issue: The general public is a major stakeholder in climate change adaptation. Until REACCH, the Pacific Northwest (PNW) had no baseline information about public perceptions of climate change risks within the region, especially risks related to agriculture and food security. Action taken: We implemented the first representative survey of the general public to assess baseline perceptions about climate change in the three-state region. In general, the survey addressed the need within the PNW to identify and capture public input on the cause and effects of climate change. The results indicate the general public is about twice as likely to understand climate change as a human-caused phenomenon than as a natural phenomenon. Those who perceive the issues are human caused also tend to show higher levels of concern about the effects of climate change. Women in the region tend to perceive a greater level of risk from climate change than do men. Additionally, 90% of respondents indicated at least some agreement that climate change poses risks to agriculture globally. The baseline results suggest that many people in the Pacific Northwest understand the importance of agriculture and the need for agriculture to adapt to a changing climate. Dymond-Smith, S., A. Gessler, and J. D. Wulfhorst. 2016. Perceived risk of climate change in the Pacific Northwest: A Geographic Look at Public Perceptions. Presented at the 7th Annual Northwest Climate Conference, November 14-16, Stevenson, WA. Bernacchi, L., J. D. Wulfhorst, L. McNamee, and M. Reyna. 2014. Pioneering public perception of climate change and agriculture in the Pacific Northwest. Presented at the 5th Annual Northwest Climate Conference, September 9-10, Seattle, WA. Above: Producer respondents as classified within an agroecological system. Below: Producers' level of perceived risk to their operation from climate change policies depicted within a modeled characterization of agroecological zones in the year 2050, which was presented and described in the survey. Issue: Although previous research has increased our understanding of cereal producer adaptation behaviors within the Pacific Northwest, the results have not measured climate change contexts or provided geo-reference points to spatially map survey data. Action taken: We conducted the first cross-sectional and comparative survey to measure cereal producers’ perceptions of climate change. We then created analytical structures to visualize the results within agroecological classification systems. Results: Preliminary analyses focused on integrating producer survey data and other REACCH project components and on finalizing an agroecological classification for each producer (top). 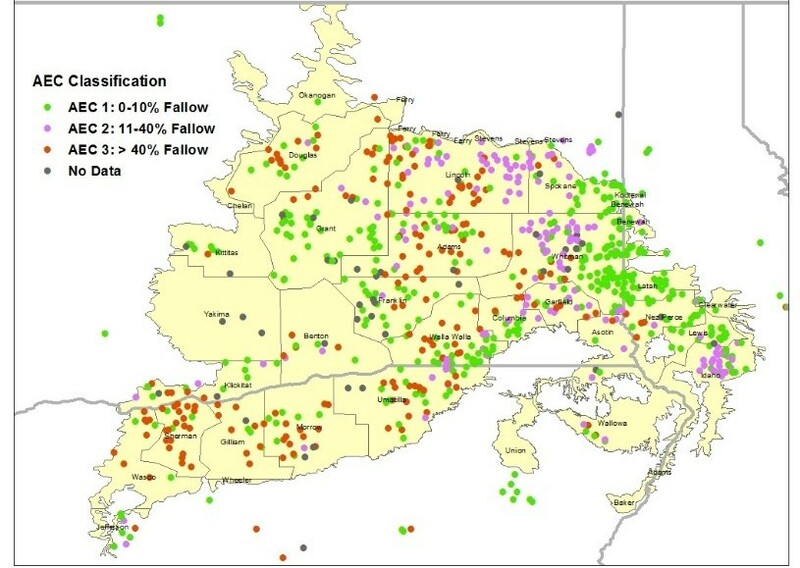 While figure 1 does illustrate respondent dispersion across the three agroecological classifications used in the project (delineated as percent fallow: annual cropping [0–10%], intermediate [11–40%, and crop-fallow [> 40%]), it also shows how the classification system is dynamic in that the geography of the classes will likely shift over time. When coupled with other metrics within the survey, the mapped analyses display the intersections of the agroecological classifications and attitudes of the respondents (bottom). This map highlights the level of perceived risk (low, medium, high) among producers about how climate change policies may affect their operations. It maps the responses within a futuristic model of agroecological zones predicted for the region. Results highlight that producers in the intermediate- and fallow-zone subpopulations on average tend to perceive higher risk to their operations. Wulfhorst, J. D., J. Gray, L. McNamee, and I. Roth. Applying classification systems to wheat producers’ perceptions of climate change risk in the Inland Pacific Northwest. Agriculture, Ecosystems & Environment. In preparation. Tillage practices of inland Northwest wheat producers in 2012 and 2015 (n = 900 with a response rate of 46% in 2012; n = 462 with a response rate of 43% in 2015). Issue: Given its variable precipitation, erodible soils, and over 35 years of concentrated research on farm conservation practices, the Pacific Northwest (PNW) has a unique record of agricultural production and rural sociological research. Although not planned as a longitudinal experiment, the region lends itself to the kind of case study rarely reported in rural sociology and risk management literatures—a long-term agricultural community analysis to understand adaptation trends over time, including to climate change. 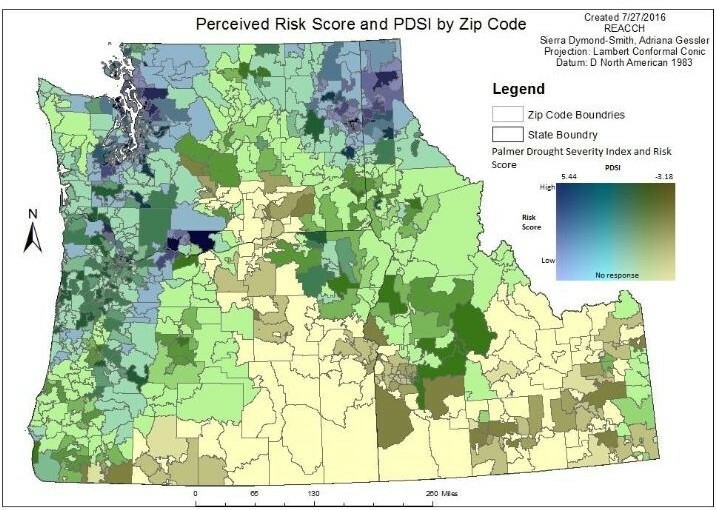 Action taken: We continued social analyses of producer perspectives in the inland PNW, adding the capacity to analyze producer views of climate change and providing baseline data on how producers carry out operations in the region. Results: In 2012 and 2015, we conducted the latest region-wide surveys with wheat producers via baseline and follow-up surveys. One of the core questions asked of respondents was the level of tillage and types of practices they use in the operation. As shown in the accompanying figure, there continues to be a trend over time from conventional toward conservation-oriented tillage. The 2015 results indicate a slight decrease in no-till practitioners, but the result is not statistically significant. 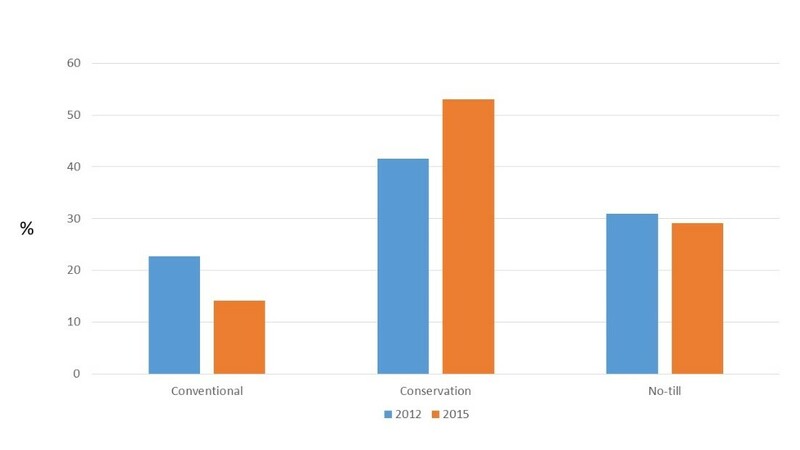 More telling, the overall trend toward the conservation end of the scale between 2012 and 2015 is a substantive increase and indicates that while many producers continue to deny human-caused climate change, many continue to adapt their operations toward best-management practices based in conservation. 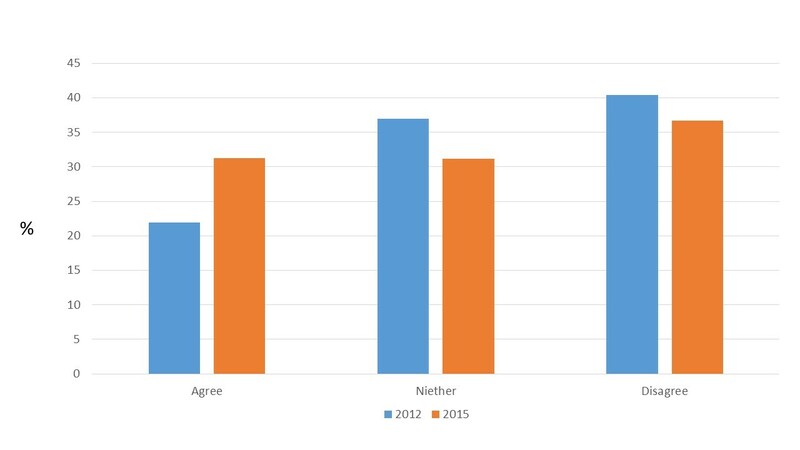 Change in producer perspectives between 2012 and 2015 about whether they will have to make serious changes in their farm operations to adjust to climate change. Issue: Prior to REACCH, and despite predictions for significant and rapid change in the Pacific Northwest (PNW) climate, there was comparatively little understanding of the social science aspects of a changing climate in the region. Yet knowledge about basic elements such as people’s beliefs about climate change is needed for identifying adaptation and mitigation scenarios in public policy. Action taken: We conducted a baseline assessment of community and producer perspectives on climate. We also accomplished a longitudinal comparison among producers that is unique among agricultural regions. We measured producer perceptions about whether a changing climate would affect their operations. Results: In 2012, we found that while 80% of producers agreed they have observed weather patterns changing in their lifetime, a much smaller proportion (39%) agreed that the average global temperature is increasing. Even fewer (21%) agreed that human activities are the primary cause of climate change. These results suggest that producers differ from the general public as a whole, which increasingly perceives human activities as the cause of climate change. In our longitudinal comparison, we documented a substantial increase between 2012 and 2015 in the percentage of producers who perceive that they will have to make changes to their operations> due to climate change. Wulfhorst, J. D., L. McNamee, and I. Roth. Climate change beliefs among wheat producers and effects to operational decisionmaking. Frontiers in Ecology and Evolution. Submitted. 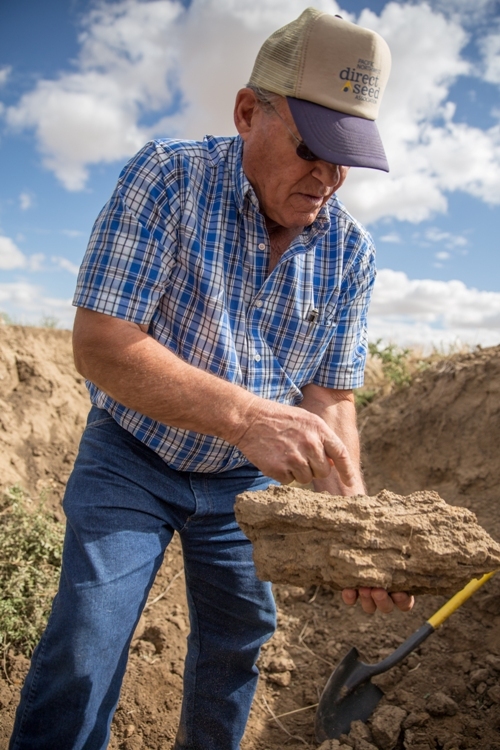 John Aeschliman has been restoring soil life with no-till practices since the 1970s. The ground now is filled with earthworms. Here, Aeschliman points out how worms aerate and fertilize the soil. Photo by Alex Garland. stories are not well known, however, creating a need for accessible materials that demonstrate success and agricultural benefits. The five producer profiles we wrote tell the personal stories of the farmers, how they adopted climate-friendly practices, and the benefits they have realized. The relative brevity of the articles enhances their impact and readability, as do the magazine-feature writing style and layout and high-quality photo illustrations. Results: Producer profiles provide extension tools for dissemination among farmers, telling the stories of successful farmers in an accessible way. Employing the power and credibility of farmer-to-farmer communication, these tools build confidence among farmers that climate-friendly practices are viable and profitable. This makes it more likely producers will implement such practices in their own operations. Groups report back after facilitated breakout sessions during the Agriculture in a Changing Climate Conference in Kennewick, WA in March 2016. Issue: To best support the future productivity and resilience of US Northwest farming, we need to expand the network of extension educators and agricultural professionals capable of communicating with regional stakeholders about agriculture and climate change. Action taken: We have reached 500-750 individuals each year through live presentations on issues related to climate change and agriculture. We also hosted an Agriculture in a Changing Climate workshop in 2016, from which the outcomes were distilled (with REACCH support among others) into a set of priorities for research and extension in the region, and published. We have expanded the content on our online platforms, reacchpna.org and agclimate.net, which serve as ongoing regional resources, offering agricultural educators and professionals the opportunity to stay engaged and up-to-date on issues relating to climate change and agriculture. Results: The Agriculture Climate Network (agclimate.net) was visited 2181 times in 2016, and almost 8,000 times in 2017, The website now has 221 newsletter subscribers, 310 Twitter followers, and 109 Facebook followers. After the Agriculture in a Changing Climate workshop in 2016, 100% of those who completed an evaluation said they had gained knowledge relating to climate change and agriculture. In addition, 71% were planning behavior changes based on what they learned and experienced at the conference, while an additional 19% were considering behavior changes. The Agriculture Climate Network is online at agclimate.net. Yorgey, G. G., C. E. Kruger, B. R. Saari, S. A. Hall, E. Whitefield, N. Embertson, V. P. Jones, K. Rajagopalan, E. Allen, G. Roesch-McNally, B. Van Horne, J. Abatzoglou, H. Collins, L. Houston, C. Seavert, and T. Ewing. 2016. Agriculture in a changing climate: Research and extension priorities in the Pacific Northwest. White Paper. Center for Sustaining Agriculture and Natural Resources, Washington State University, Mt. Vernon, WA. Issue: New strategies are needed—and need to be shared—to maintain productive and sustainable farming operations across the landscape of the US Northwest as the climate changes. Action taken: We have shared the innovative practices that forward-thinking farmers in the region are using, and that have the potential to ameliorate climate change impacts, through 13 multi-media case studies, using a core of REACCH funding with additional leveraged funds. We are also publishing a book that summarizes research advances through the lens of the management decisions that farmers make (currently under review as a WSU Extension Publication). Results: 11 case study videos and 3 written case studies have been completed, and others are in progress. By the end of 2016, videos and written case studies had been viewed over 12,000 times, and the videos have supported numerous conferences across the region, including the Pacific Northwest Direct Seed Association, and Irrigated High Residue Farming workshops. Advances in Dryland Farming in the Inland Pacific Northwest was published in mid-2017, and as of the end of the year, we had distributed roughly 1200 copies. An online version was also freely available. Yorgey, G. G., K. Borrelli, A. McGuire, and K. Painter. Strip tillage and livestock integration: Eric Williamson (Farmer to Farmer Case Study Series). Pacific Northwest Extension Publication. Washington State University Extension, Pullman. In preparation. Yorgey, G. G., K. Borrelli, and K. Painter. Enhancing cropping diversity: Steve and Nate Riggers (Farmer to Farmer Case Study Series). Pacific Northwest Extension Publication. Washington State University, Pullman. In preparation. Yorgey, G. G., K. Borrelli, and K. Painter. Grazed cover cropping: Drew Leitch (Farmer to Farmer Case Study Series). Pacific Northwest Extension Publication, Washington State University Extension, Pullman. In preparation. Yorgey, G. G., K. Borrelli, K. M. Painter, and H. Davis. Conservation tillage in a winter wheat – fallow system: Ron Jirava (Farmer to Farmer Case Study Series). Pacific Northwest Extension Publication. Washington State University Extension, Pullman. In review. Yorgey, G. G., K. Borrelli, K. M. Painter, and H. Davis. Stripper header and direct seeding, Ron and Andy Juris (Farmer to Farmer Case Study Series). Pacific Northwest Extension Publication. Washington State University Extension, Pullman. In press. Yorgey, G. G., S. I. Kantor, C. E. Kruger, K. M. Painter, H. Davis, and L.A. Bernacchi. Mustard cover cropping in potatoes: Dale Gies (Farmer to Farmer Case Study Series). Pacific Northwest Extension Publication. Washington State University Extension, Pullman. In press. Yorgey, G. G., S. I. Kantor, K. M. Painter, L. A. Bernacchi, H. Davis, and R.D. Roe. 2016. Enhancing crop diversity: Steve and Becky Camp (Farmer to Farmer Case Study Series). Pacific Northwest Extension Publication 690. Washington State University Extension, Pullman. Yorgey, G. G., S. I. Kantor, K. M. Painter, H. Davis, and L. A. Bernacchi. 2016. Precision nitrogen application: Eric Odberg (Farmer to Farmer Case Study Series). Pacific Northwest Extension Publication 691. Washington State University Extension, Pullman. Yorgey, G.G., S.I. Kantor, K. M. Painter, H. Davis, R. D. Roe, and L. A. Bernacchi. 2016. Flex cropping: Bill Jepsen (Farmer to Farmer Case Study Series). Pacific Northwest Extension Publication 681. Washington State University Extension, Pullman. Yorgey, G., and C. Kruger, eds. 2017. Advances in Sustainable Dryland Farming in the Inland Pacific Northwest. Washington State University Extension Publication EM108, Pullman, WA. In press. Yorgey, G. G., and A. McGuire. Strip tillage of onions: Lorin Grigg (Farmer to Farmer Case Study Series). Pacific Northwest Extension Publication. Washington State University extension, Pullman. In review. Issue: Farmers across the diverse landscape of the inland Pacific Northwest face varying resources and resource constraints over time and space. Detailed information on the specific practices, costs, yields, profitability, and attitudes toward change of individual farmers is not generally available. Action taken: A group of 47 growers selected for geographic location, history of university collaboration, innovative farming practices, and leadership roles agreed to participate in a longitudinal survey. For four years, we conducted personal, on-farm interviews with these growers. We gathered information on social, economic, agronomic, biotic, and climatic topics. We gathered detailed information on machinery, input usage, and field operations. Our unique approach allowed interdisciplinary scientists to add questions in each year of the survey. Our survey covered a variety of on-farm variation, as both 2011 and 2012 were much wetter than usual, while 2014 and 2015 were much drier than normal. Results: Our project illustrated annual economic fluctuations due to differing levels of precipitation. We used the results to create baseline enterprise budgets for three distinct agroecological classes. Detailed information from our surveys helped other researchers understand how growers’ practices differ across the region. Grower responses also guided project scientists in many areas of research, including technology usage, pests, and grower use of extension services. Growers are highly individual, and solutions for climate challenges need to reflect the diverse motivations and resources available to each grower in order to be both effective and acceptable. Kirby, E. M., W. L. Pan, D. R. Huggins, K. M. Painter, and P. Bista. 2017. Rotational diversification and intensification. In: Yorgey, G., and C. Kruger, (eds), Advances in Sustainable Dryland Farming in the Inland Pacific Northwest. Publication EM108. Washington State University Extension, Pullman, WA. In press. Crop consultants pose for a photo in front of an Apache sprayer at Precision Agriculture Demonstration Day. Photo by Leigh Bernacchi. Issue: Sharing climate change adaptation information and management practices with producers is a challenge for university extension. Action taken: We conducted the first large-scale survey of agricultural producers’ perspectives on climate change in the Pacific Northwest. The survey’s findings led to our investigation of crop consultants’ role in climate change communication. We interviewed crop insurance agents, chemical manufacturers, and consultants from multiple companies. Results: Crop consultants and advisors can help bring about adaptation to climate change in the dispersed and diverse farming community. Whether they work with a private company or as independent contractors, they manage multiple farms’ pest and nutrient applications and address any issues that arise throughout the year. They are in constant contact with growers, often working 80 hours per week and creating both short- and longterm plans (3 to 5 years). All the consultants we interviewed had observed changes to climate in their lifetimes and feared drought in the rain-fed system, but younger consultants were more likely to attribute climate changes to human causes. Because of their intimate relationship with growers, they provide a communication pathway between the university’s research programs and day-to-day grower questions. Crop consultants will continue to be an important target audience for extension in addressing climate change. Bernacchi, L. A., and J. D. Wulfhorst. 2017. Crop consultants serving as “climate consultants”: An Extension opportunity for climate change communication. Journal of Extension. In press. Aaron Esser, WSU Extension specialist at Wilke Farm Field Day. Photo by Sylvia Kantor. Issue: Climate change, global warming, and the idea that humans could affect something as vast as our atmosphere are fraught with political, economic, ideological, and social connections. The challenge is to identify opportunities and barriers to climate change adaptation and mitigation among Pacific Northwest (PNW) cereal producers. Action taken: To overcome barriers to climate change adaptation among PNW cereal growers, we studied their existing trusted relationships and resources for production management and climate change information through a large-scale mail survey of 900 producers. Results: Trust is critical in any societal conversion to new ideas or adoption of new technologies. Our research has identified existing and novel pathways for reaching producers with climate change information. Our survey first asked producers who they trust with respect to production management strategies. We found that they largely trust each other followed closely by crop advisors associated with a company. However, with respect to climate change information, we found that university Extension is their most trustworthy resource followed by conservation districts and crop consultants associated with a company. Climate information presented online could be useful to growers. Producers use the Internet daily to access farm-related information, although they are less likely to use mobile applications to access this information. Our results suggest that university Extension can continue to be effective in informing producers about climate-change impacts to their production systems and can effectively use digital means of information delivery. Borrelli, K. A., G. E. Roesch-McNally, J. D. Wulfhorst, S. D. Eigenbrode, G. G. Yorgey, C. E. Kruger, L. A. Bernacchi, L. L. Houston, and R. L. Mahler. Inland Northwest cereal producers’ trust in sources of climate information and use of technology. Natural Sciences Education. In review. Attendees at a field day event in north-central Washington in May 2014. Issue: To best support the future productivity and resilience of Pacific Northwest (PNW) farming, farmers need improved management knowledge relevant to mitigating and adapting to climate change. Action taken: Working in collaboration with members across the REACCH team, we have produced and supported field days, conference talks, webinars, blog articles, factsheets and other educational materials that provide management-specific knowledge relevant to mitigation and adaptation in dryland farming systems in the Northwest. Results: Grower surveys across the region in summer 2016 indicated that 86% of respondents had gained knowledge relevant to mitigation (e.g., soil carbon management), while 79% had gained new knowledge relating to adaptation (e.g., managing pests, weeds, and diseases). Meanwhile, 87% had made changes to improve management of soil carbon, and 88% had made changes to improve management of pests, weeds, and diseases.